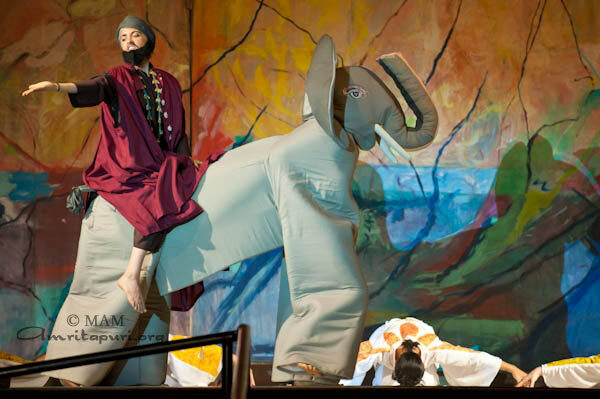 On Christmas eve around 1500 international visitors from all over the world and many thousands more from all parts of India were on hand for the festivities. 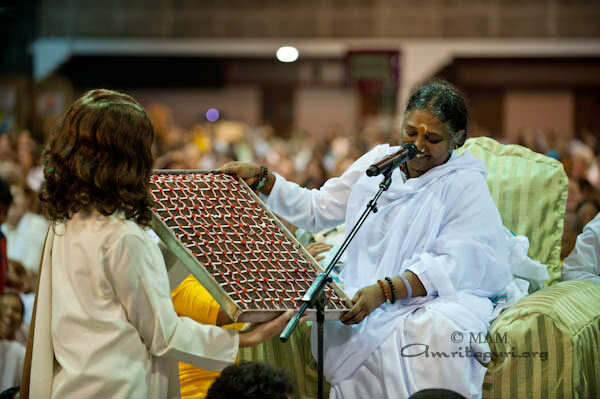 Before the actual program began, Amma had come out in the late afternoon for meditation at the seashore and from there to the evening bhajans. 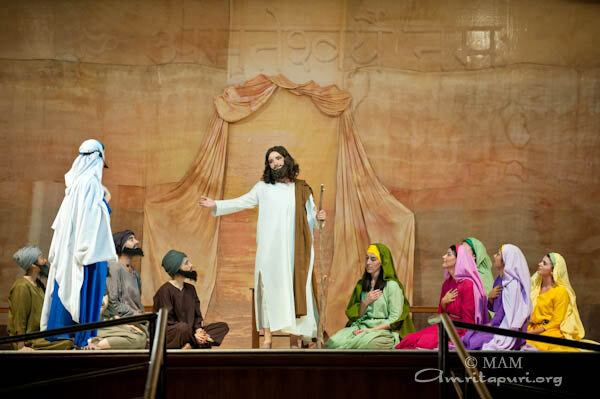 After bhajans, the hall and stage were quickly transformed into a theater, ready to stage this year’s original Christmas musical, Mary, Mary, Mary & The Highest Commandment, performed by an ensemble cast of ashram residents and devotees from all over the world. 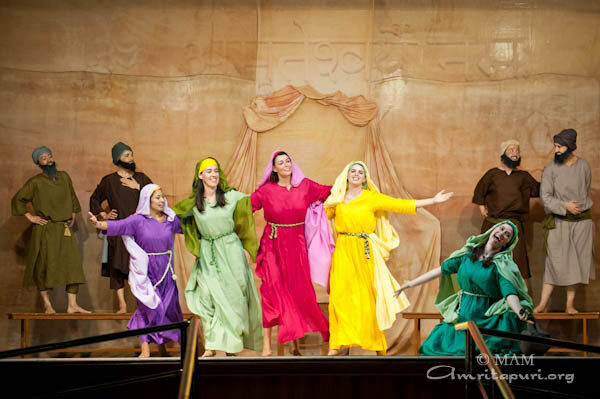 Through this play we peeped into the hearts of some of his closest devotees, three women–each named Mary: Mother Mary, Mary of Bethany and Mary of Magdala. 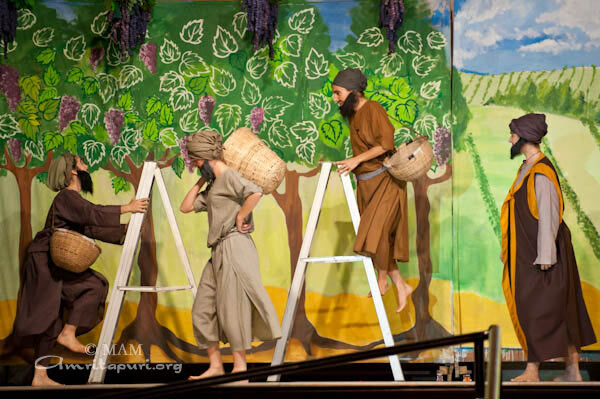 As we watched their stories unfold before us, we got a special chance to experience how he stepped into their hearts, and guided each one along their own individual path and follow their lives as Jesus teaches them through his parables about the commandments of God and the path to eternal life. 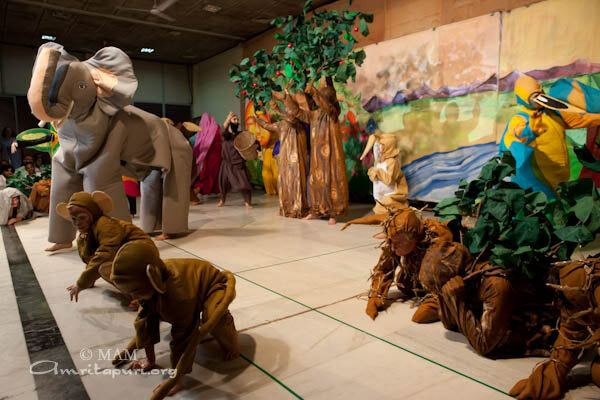 Those involved in the production spent several weeks preparing, composing original music, choreographing several dance numbers, painting huge murals for backdrops for each scene, stitching costumes for the variety of characters (including various biblical characters, others dressed as birds, monkeys and even an elephant! ), etc. 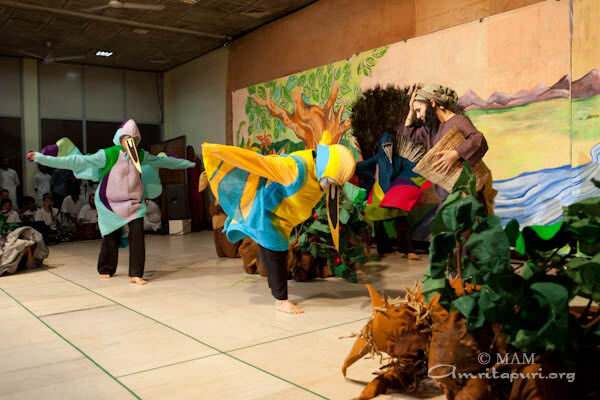 and all their hard work showed as the performance was spectacular and went off without a hitch. 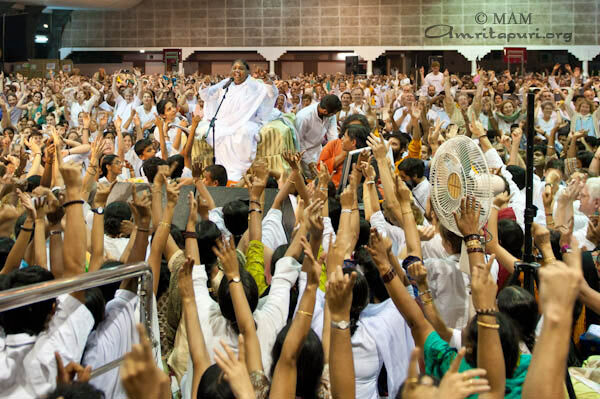 Amma had a front row center seat to watch the entire performance unfold. 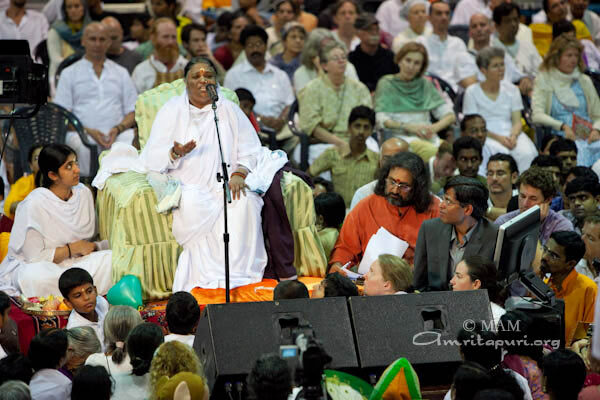 After the show finished, Amma gave her Christmas message, which Swamiji then translated into English. 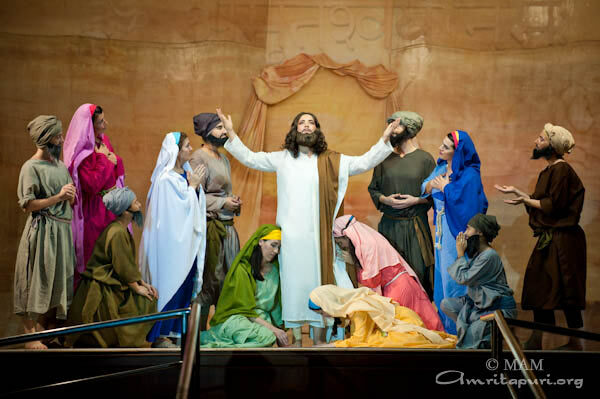 The person who acted as Jesus in the play then presented Amma with the first tray of Christmas cake so it could be distributed to everyone. When the Christmas cake was brought to her, she blessed it and told us that WE should become the cake. 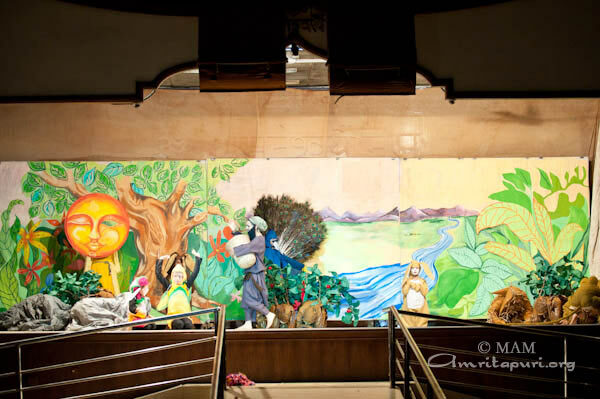 The first pieces Amma offered to the devotees from several of Amma’s satsangs overseas who were present, watching the festivities via a web telecast. In a historic partnership, IIT (Indian Institute of Technology) Bombay and Amrita University have come together to deliver a nationwide teacher empowerment program delivered online via India’s emerging high speed educational network. 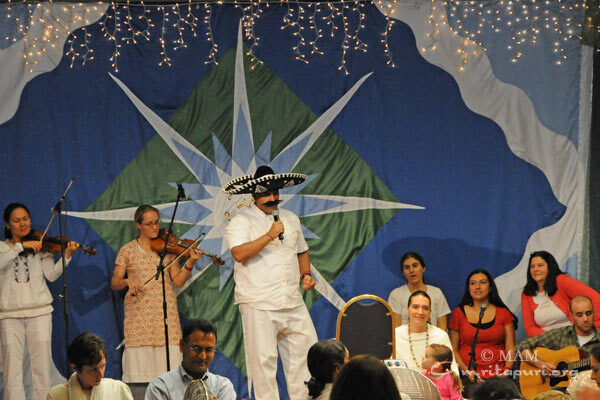 The goals of this program are to improve the quality of teachers in professional colleges to world class levels. 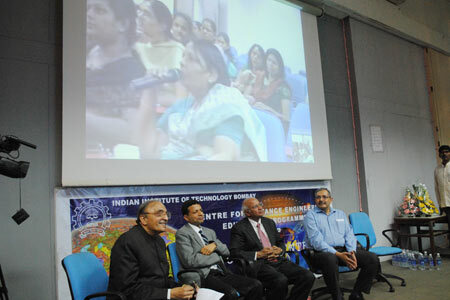 Over 1000 college teachers from around 500 professional institutions gathered at 32 nodal centers across the country to attended a 2-week online workshop on “Database Management Systems” from the 13th to the 22nd of December 2010. The session was led by Dr. Sudarshan, IIT Bombay Professor and the renowned author of the standard international textbook on Database Systems. These 32 remote centers used the A-VIEW (Amrita Virtual Interactive E-Learning World) system developed by Amrita University, to connect and communicate. These online workshops for improving the quality of teachers are the brainchild of Prof. D.B. Phatak, Subrao M. Nilekani Chair Professor, IIT Bombay, who said, “It is gratifying to see that my dream to empower thousands of college teachers in core engineering courses has been realized.” National Knowledge Commission in its findings has concluded that the low quality of higher education is one of the key factors affecting India’s economic growth. IIT Bombay Director Prof. Devang Khakhar in his address said that IIT Bombay is committed to make a difference to education and research in Indian academia through several outreach programs. Within seven years, what started as a hospice for HIV positive and AIDS patients, came to be recognized as “the best community care centre in Kerala, for the year 2010.” The award, by Kerala State AIDS Control Society (KSACS) consists of a trophy and citation. 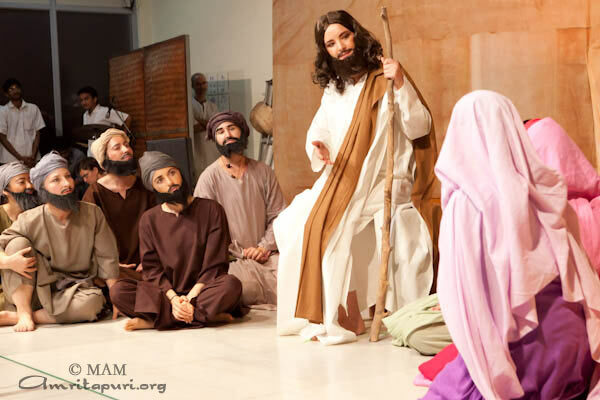 Amma says ‘Love can cure diseases, heal wounded hearts and transform human minds…” Amrita Kripa Sagar, born out of Amma’s infinite love, was started by MAM in September 2003, and administered with round the clock love and compassion by Amma’s team of dedicated disciples. 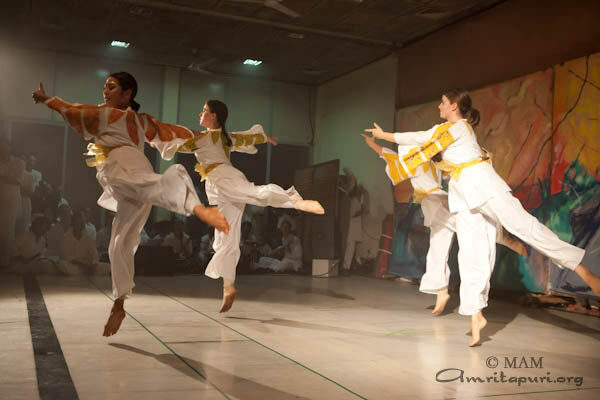 The holistic approach, apart from basic medical support, provides psychological support and spiritual services. 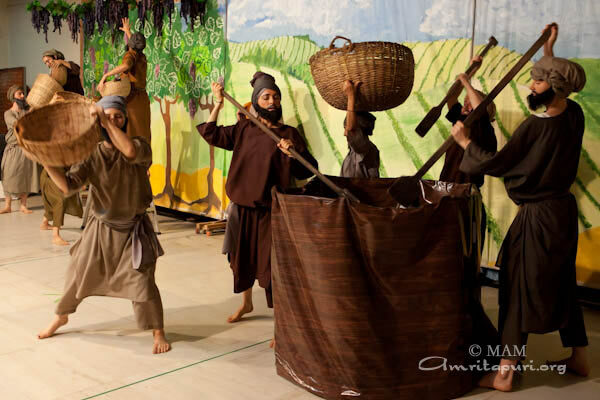 Most importantly, they who might later be ostracized by society and turned to streets by their families are taught skills to earn their own livelihood. So, identity of the inmates is kept confidential at all times. The services further extend even to the families of the hapless HIV victims, in terms of scholarships, provisions etc. 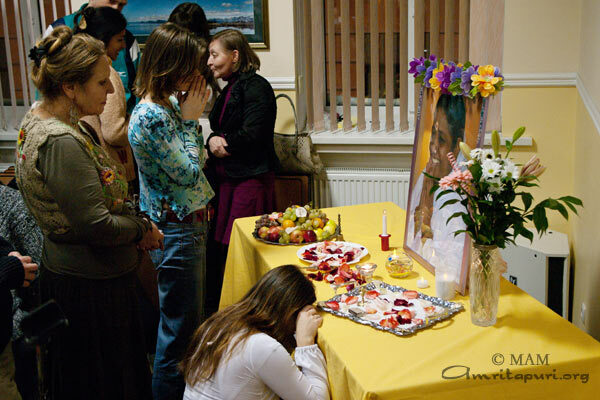 Amma’s programs in India are starting on 2011 Jan 3. Mata Amritanandamayi Math, Amritamayi Nagar, Vellimadukunnu, Kozhikode – 673 012. Madurai College Grounds, Near Periyar Bus stand, Madurai. Mata Amritanandamayi Math, Nallampalayam, Kavundampalayam, Coimbatore. 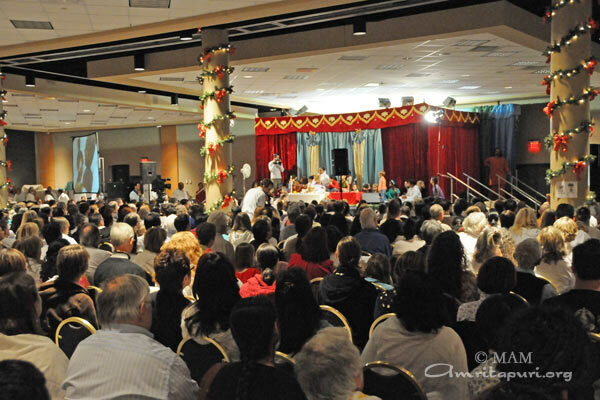 After San Ramon, Amma travelled to Dearborn, Michigan for the final programs of the 2010 of the tour. 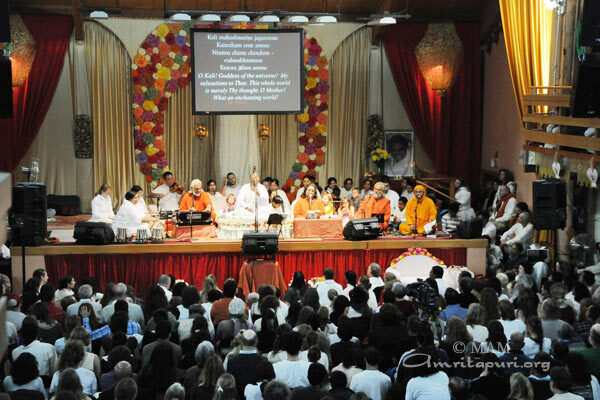 After completing her European tour, Amma visited the United States for her annual fall visit to San Ramon, California and Dearborn, Michigan. 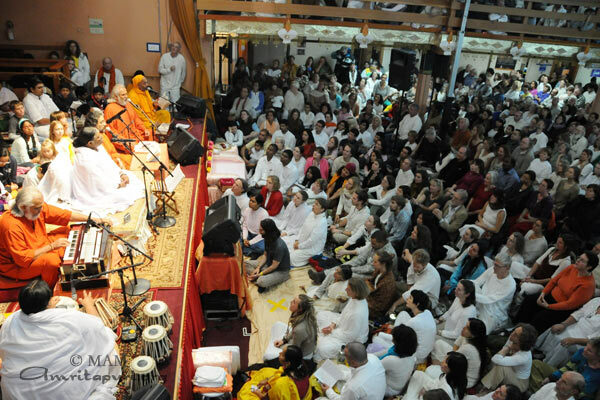 The tour began with 5 days of programs held at the MA Center, the San Ramon ashram. 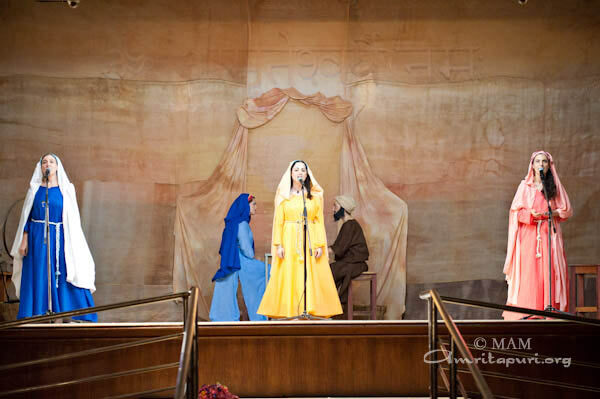 A three day retreat was held during Amma’s visit to San Ramon, which gave the devotees a chance to spend more focused time with Amma. 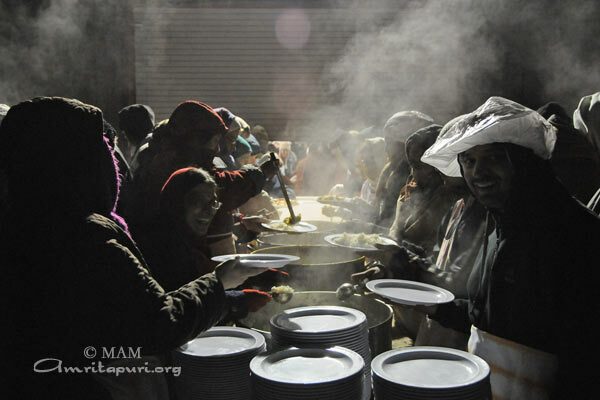 All had the opportunity to ask spiritual questions to Amma and all were served a prasad dinner from her own two hands. 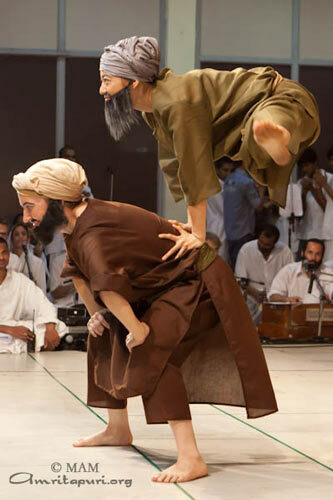 The legendary tabla player, Ustad Dildar Hussain, who accompanied the late world renowned Nusrat Fatah Ali Khan for more than 30 years, for came and performed for Amma. 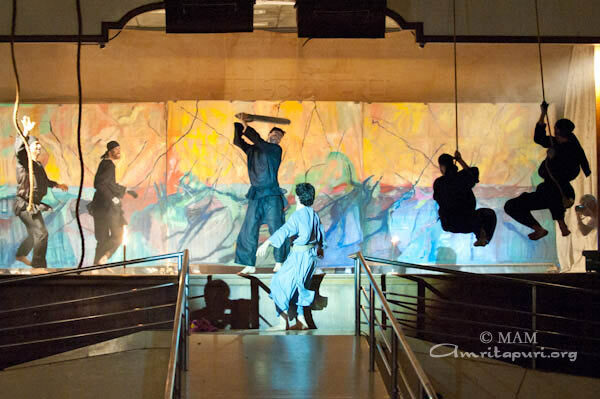 On Nov. 26th, 2011, Br. 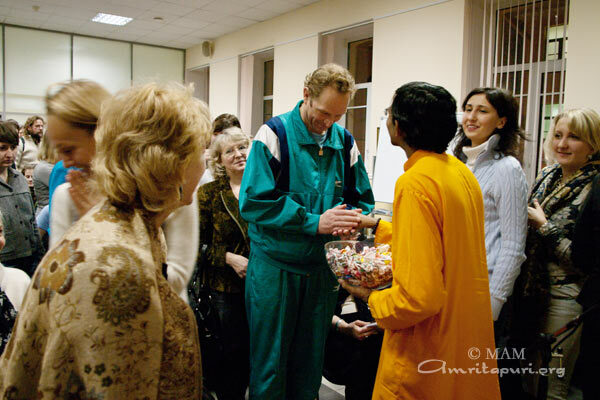 Shubamrita Chaitanya held a public programme in the beautiful city of St. Petersburg in Russia. 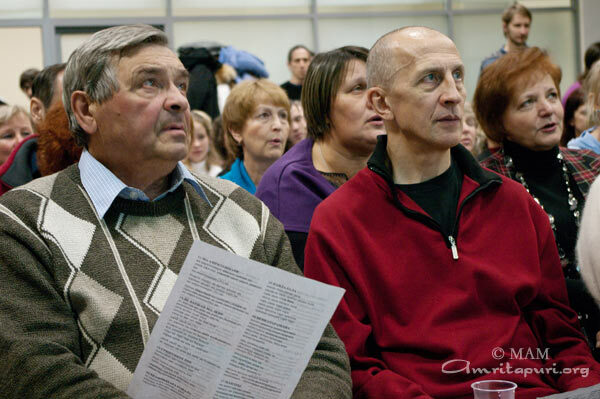 Despite severe weather conditions and temperature of -10 degree Celsius, more than 150 people came to the event, which took place in a centrally located conference hall at the Lityeynyy prospekt. Br. 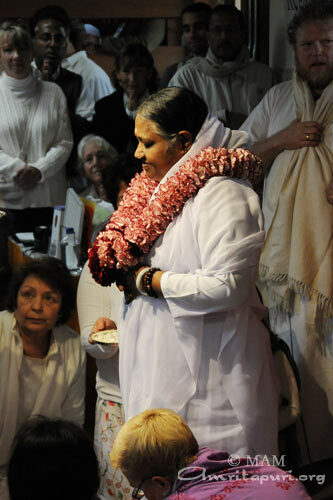 Shubamrita gave a talk on the “Way to Inner Peace” based on Amma’s teachings, followed by devotional singing and a short meditation. 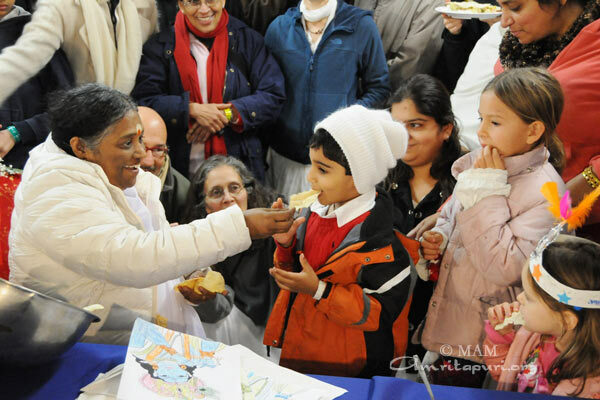 Sri Mata Amritanandamayi Devi’s 2010 Europe visit to 8 countries, darshan programs, beautiful moments.